In an era where seemingly every single comic book series one way or another bleed into each other in an effort to create can’t miss “events,” I’ve found it amazing that outside of a few brief exceptions, Marvel has managed to keep Spider-Man and Flash Thompson’s Agent Venom in separate corners for as long as they have. 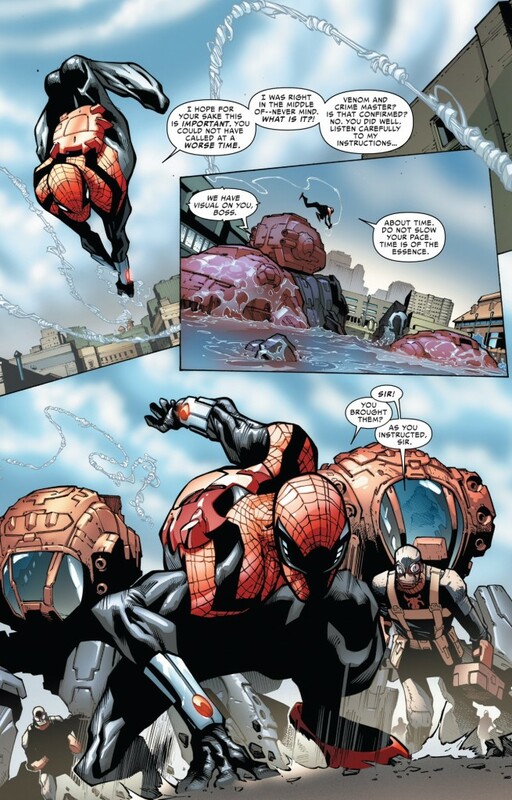 As a result, the confrontation between the two characters in Superior Spider-Man #22 is not only fresh because it involves the “Superior” Spider-Man rather than our mom and dad’s “Amazing” Spider-Man, but also because Marvel hasn’t spoiled it by overkilling the concept. With that said, as the first installment of a four-part arc, Superior #22 is the epitome of a set-up issue. That’s not an indictment in any way, shape or form, but writers Christos Gage (who gets script credit for the next four issues) and Dan Slott appear to be moving a bunch of chess pieces around the board in an effort to not only build this storyline, but to further establish next year’s “Goblin Nation.” Despite Superior #22’s cliffhanger ending (and even with Slott snarkily acting callous about Flash’s prospects during the New York Comic Con Spider-Man panel I don’t expect Spider Ock is going to do anything too extreme to Agent Venom considering there’s three more issues in this arc to go and the character is already slated to join Guardians of the Galaxy next Spring), this issue marks a relatively small step in the larger overall Superior story. Still, Slott and Gage manage to advance a number of subplots in a surprisingly humorous issue. The official opening of “Parker Industries” might have “Peter” acting a little more super-villainy than he has the past few issues, but the slight change in characterization did result in some legitimately funny lines. Peter quoting Watchmen’s Rorschach and later offering cake in the cafeteria (but don’t expect this every day) is the kind of socially awkward, trying-so-hard-to-not-sound-like-Doc-Ock-that-he-sounds-like-Doc-Ock behavior I’ve come to expect at this stage in the Superior story. Since the beginning of the Superior status quo, we’ve been mostly conditioned to be laughing at Otto, not with him. The character has evolved a bit in recent issues to exhibit a very deliberate sense of humor. These scenes in Superior #22 give us a taste of both ends of the spectrum. But beyond the chuckles, we saw some major advancements in the relationship between Peter and Anna Maria Marconi (and some seeds may have been planted for one of those upcoming “cringe-worthy” moments Slott was promising during NYCC when Aunt May sees Anna at Parker Industries and chuckles to Jay Jameson about the “diversity” of the company) when the duo appear to get a little more “physical” with each other than we’ve seen in the past. 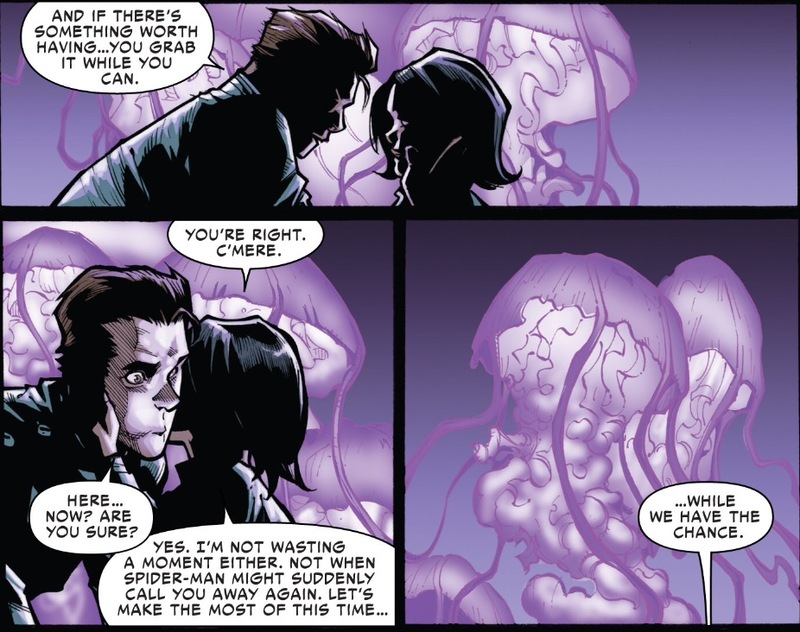 Family friendliness aside (and while Slott and Gage do seem to linger on the moment a bit too much when Spider Ock talks about being “interrupted” a few pages later, whatever the two of them did is sincerely up to the reader’s imagination) I think this is a worthwhile direction for the story as its going to make Otto’s downfall and Peter’s return that much more awkward and painful for everyone involved since now some legitimate physically romantic feelings have been tapped. Things are going to be messy enough for Peter with classic characters like Mary Jane and Aunt May. Now you can unquestionably add Anna Maria to that list, a person that he wouldn’t have even developed a relationship with if it wasn’t for Otto’s chicanery. As for Flash, Cullen Bunn’s characterization and storylines appear to be firmly entrenched in Marvel’s rearview mirror and I think that’s for the best. 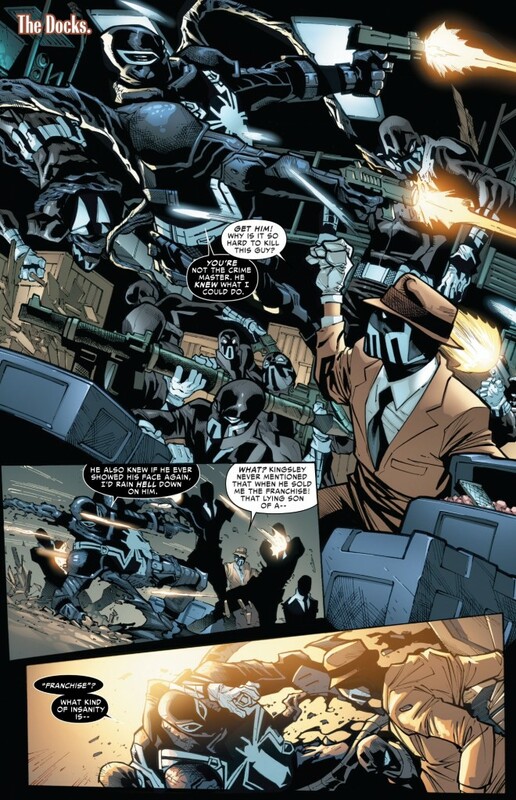 There’s no talk of deals with the devil, or of Andi, the teenaged girl who was possessed by the symbiote during the final few issues of Venom before its cancellation in October, and instead we get the Agent Venom from the first half of Rick Remender’s run on the book in 2011 – i.e. the Flash who desperately wants to emulate his idol Spider-Man by attempting to be a superhero himself. 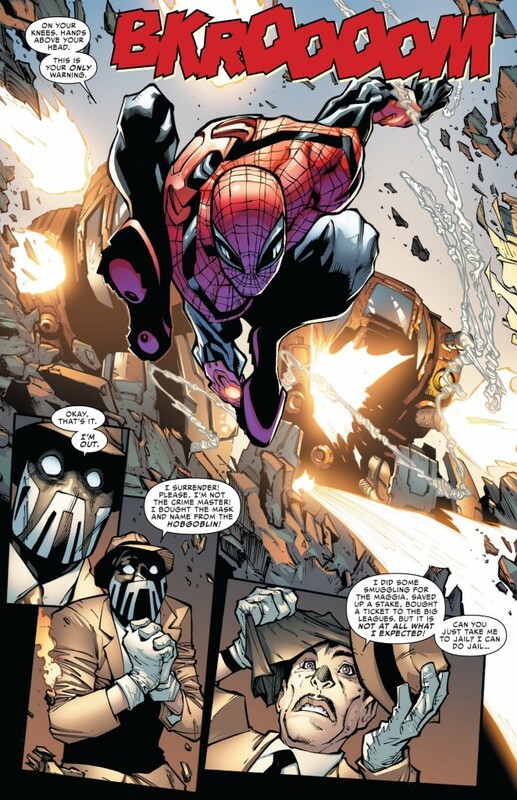 We even got a return of the Crime Master, via Roderick Kingsley’s franchising out villain personas gimmick from the “Danger Zone” arc of Amazing Spider-Man last year. Given the fact that Slott almost never reintroduces an older storylines without intent (aka, the “Chekov’s gun” theory), I’m now intrigued as to how Kingsley and his business of selling supervillain personalities to the highest bidder will figure into the Superior status quo. Humberto Ramos has been used so sparingly as Superior’s artist over the past year, I’ve come to really look forward to his arcs. He doesn’t disappoint here (and based on some of the previews for Superior #23 and #24, it looks like he’s going to continue to knock it out of the park over the next few weeks). The tendrils and overall motion of the symbiote naturally lends itself to someone with a more dynamic style, and outside of ASM #654.1, I can’t think of a time when Ramos has had a lengthy run of issues with Venom. 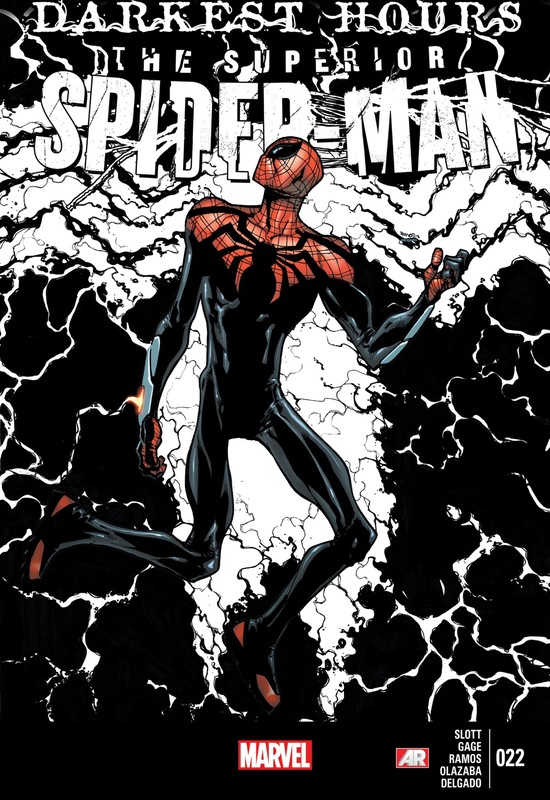 So not only is Marvel finally pulling Spidey and Agent Venom out of their respective corners, but they’ve also assigned the most appropriate artist in Superior’s rotation to the story. Sure, there’s still a lot of real world time before this storyline is resolved, but after this issue, my expectations are already considerably higher after voicing concerns a few weeks ago that this arc might end up being the comic book equivalent of jogging in place based on the timing of its release versus the much more ballyhooed “Goblin Nation” in February. 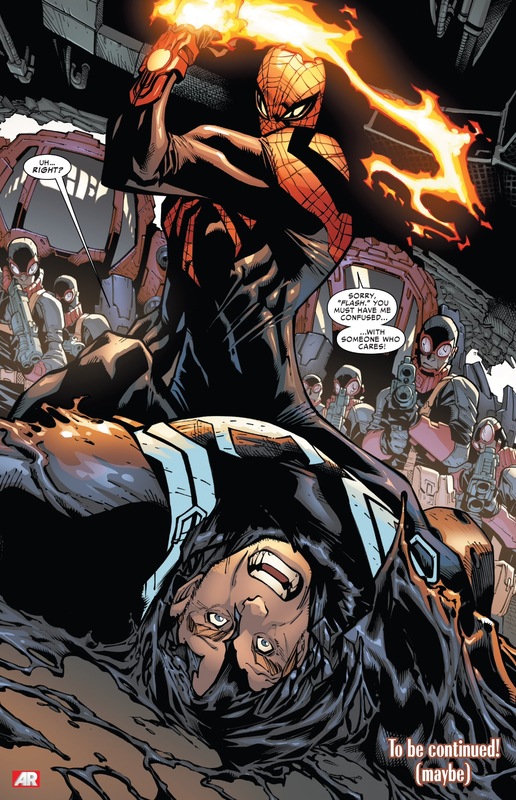 All images from Superior Spider-Man #22: Dan Slott, Christo Gage, Humberto Ramos and Victor Olazaba. Ramos drew a 5 issue Venom arc in Spectacular Spider-Man V2. Also, did you really mean to say you’re “not intrigued” by how Kingsley figures into the Superior status quo? v2 Spectacular is a total blind spot for me so thanks for mentioning. Will have to check it out. I thought the final full-page shot by Ramos was an excellent throw-back to the iconic cover of ASM #316 by McFarlane. He really has grown on me as a Spider-artist and I’m loving this arc as a whole.